Seniors New to Medicare and looking for a Medicare Supplement Insurance Plan? You may have received a postcard from Retirement Transitions like the one shown. Seniors who are turning 65 and new to Medicare receive tons of mail. Multiple phone calls. And possibly insurance agents showing up at your door. It’s not right. Retirement Transitions isn’t a nuisance. Our goal is to let seniors know that their is a place you can go to get unbiased information and be served and not pushed into an insurance plan you aren’t comfortable with. Retirement Transitions helps people turning 65 and new to Medicare across the country find Medicare Supplement insurance. Retirement Transitions simplifies how to shop and compare Medicare Supplement Insurance quotes in Arizona, Iowa, Kansas, Maryland, Nebraska, Ohio, Tennessee, and more. View your State Medicare Plans. View real-time rates and plans from multiple top-rated Medicare Supplement companies without being bothered multiple times by a sales agent. Retirement Transitions puts you in the driver’s seat by letting you access personal Medicare Supplement rates without receiving phone calls or spam emails. We’re dedicated to making individuals comfortable when shopping for insurance. Retirement Transitions team of unbiased specialists are available to answer questions, give unbiased guidance, support, help you apply and enroll, and will never be a nuisance to you or your family. We don’t like pushy sales people either. If you would like an appointment with one of licensed supplemental specialist, please call (402) 805-4626. We’re not an insurance company, but a consumer advocate. 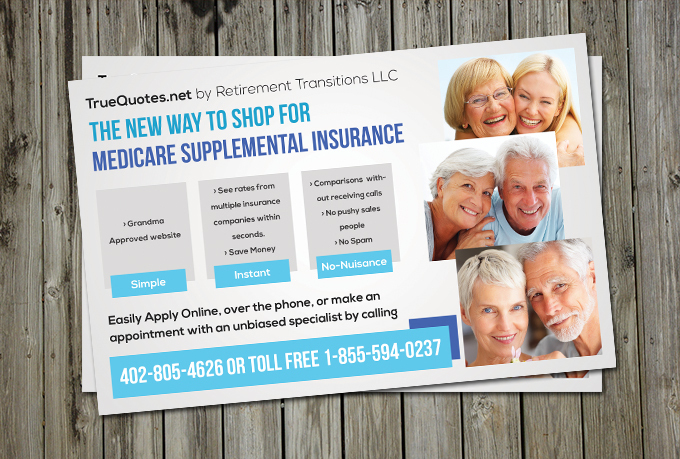 TrueQuotes.net by Retirement Transitions LLC postcard was mailed out to people turning 65 and new to Medicare in Lincoln, NE. Retirement Transitions is a health insurance agency in Lincoln, NE and serving people across the country. Call us today at (402) 805-4626.